Sgt. William Meyer and Sgt. Frank Christian of the Sheriff’s Department map out strategy with Sgt. 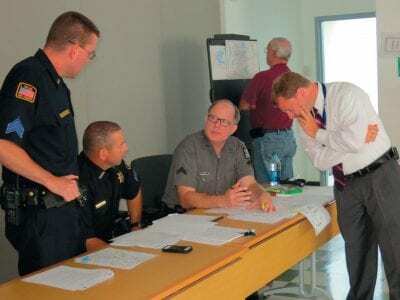 Jeff Bridges of the NYSP and Commissioner of Emergency Services Adam Stiebeling last week while Brewster Fire Chief Bill Reig (back to camera) st… Please login below or purchase a subscription to the Putnam County Courier to access this content. 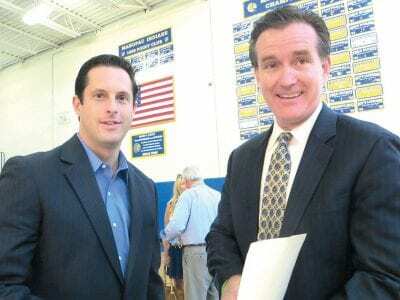 State Senator Greg Ball briefs State Senator John Flanagan at the session in Mahopac. Mandate relief is on the minds of local, county, school and state officials throughout the Hudson Valley. More than 75 representatives of school districts, village,… Please login below or purchase a subscription to the Putnam County Courier to access this content. Above: Total strangers stop to wave Old Glory. Right: The processional consisting of some 200 vehicles pases beneath a large flag hoisted atop the Brewster FD Tower Ladder truck along the interstate. Left: Ann Blackwell of Putnam Lake, widow of 9/11 … Please login below or purchase a subscription to the Putnam County Courier to access this content. Kathleen McLaughlin, Antoinette DeBellis and Erin Betivenga are also recognized. 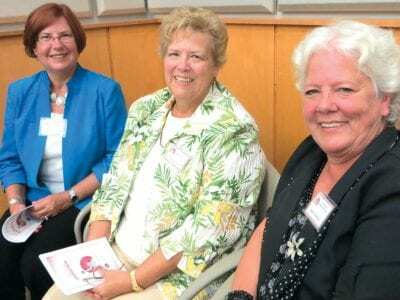 There was standing room only in the auditorium of the Putnam Bureau of Emergency Services Operation Center in Carmel Sunday when the second class of women of distinction… Please login below or purchase a subscription to the Putnam County Courier to access this content. The Class of 2014 greeted all students and staff at the front entrance of the high school on Monday morning. Right: On Tuesday, September 3 all incoming kindergarteners were invited to the Putnam Valley High School to board a bus with their clas… Please login below or purchase a subscription to the Putnam County Courier to access this content. “Contagion” is coming to the big screen at the Putnam Bureau of Emergency Services Operations and Training Center next Friday night, Sept. 20 and the public has been invited to attend. In addition to watching the medical thriller disaste… Please login below or purchase a subscription to the Putnam County Courier to access this content. Modern technology is defeating modern technology! Residents using voiceover internet protocol phones these days—who can plug that device into any jack around the world containing a network that supports the internet and get a dial tone allowin… Please login below or purchase a subscription to the Putnam County Courier to access this content. Never too old for a good laugh! 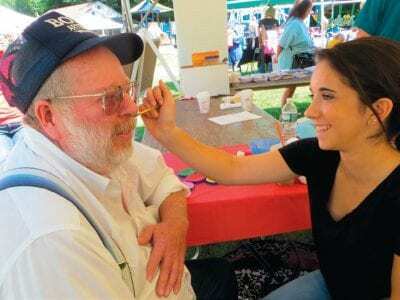 Kent well driller Henry Boyd decides to have his mustache tattooed at the Kent Community Day. Raquel DiVincenzo, 16, of Mahopac, a member of the Mission Church in Holmes, obliges. Magnificent late summer weather greete… Please login below or purchase a subscription to the Putnam County Courier to access this content. Proceeds from this year’s book sale will go toward the purchase of a whole building generator so that the library can provide respite services during power outages. Recent storms and emergencies have resulted in many patrons using the library … Please login below or purchase a subscription to the Putnam County Courier to access this content.